We're located at 955 L’Enfant Plaza North, SW, Suite 4000, Washington, D.C. 20024. Directions on how to get to our office by Metro, foot, and car follow. Upon your arrival please proceed to the 4th Floor, Suite 4000. The L’Enfant Plaza Metro Station serves the Blue/Orange/Silver/Green/Yellow lines and has direct indoor access to the IMLS office. Transfers from the Red Line can be taken at either Metro Center, Gallery Place/Chinatown, or Fort Totten. Visit Metro for an interactive map. 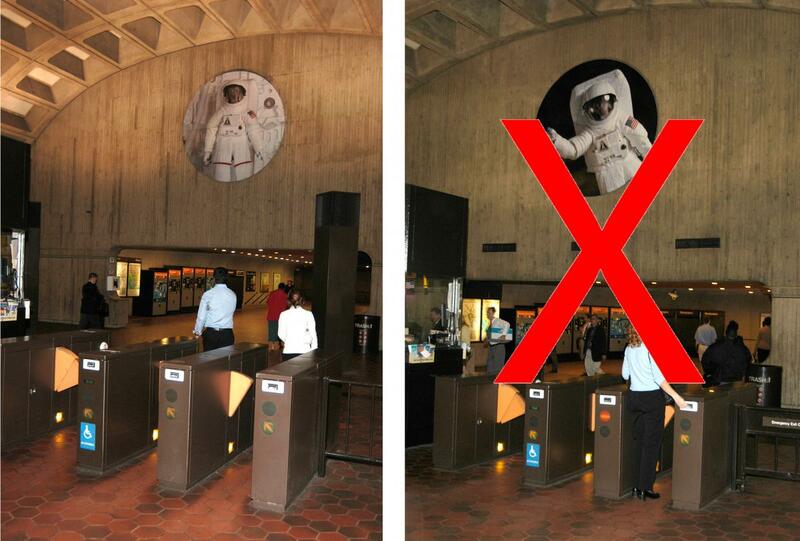 Upon exiting your train, follow signs that say “L’Enfant Plaza, D & 9th streets.” The correct exit has a picture of a dog in an astronaut suit with a white background. Do not take the exit that has a waving dog in an astronaut suit with a black background. Go straight through the glass doors into the food court. Take a right (at the Roti) and continue to follow signs for the 955 building. Take another right (at the California Tortilla) and proceed down the hallway. You will pass a dentist office on the left. Take the elevators on the right to the fourth floor, or the stairs on the left to the 1st floor, and then the elevator to the fourth floor. The Smithsonian Metro Station serves the Blue/Orange/Silver lines and has the most direct access to the 1st-floor lobby of the 955 L’Enfant Plaza North building. Transfers from the Yellow/Green lines can be taken at L’Enfant Plaza Station. Transfers from the Red Line can be taken at Metro Center Station. Visit Metro for an interactive map. Upon exiting your train, follow signs for the station elevator. Upon exiting the elevator, proceed east along Independence Avenue (towards the Smithsonian Castle, which will be on your left). You will arrive at L’Enfant Plaza Way, a wide brick street that passes underneath the Department of Energy. Cross Independence Avenue and proceed along L’Enfant Plaza Way until you reach the L’Enfant Plaza courtyard (a glass atrium is in the center). Turn left, proceed past the SunTrust Bank, and enter the 955 building through the glass lobby doors. The most direct way to our office from the National Mall is to take either 7th Street SW or 10th Street SW. You can also walk to our office from nearby hotels. Cross D Street, then turn right and proceed until you see signs for 955 / Food Court. Turn left and proceed up the stairs through the doors. Take the elevators on the left or the stairs on the right to the 1st floor. From Independence Ave., proceed south on 10th Street (L’Enfant Plaza) until you reach the L’Enfant Plaza promenade. 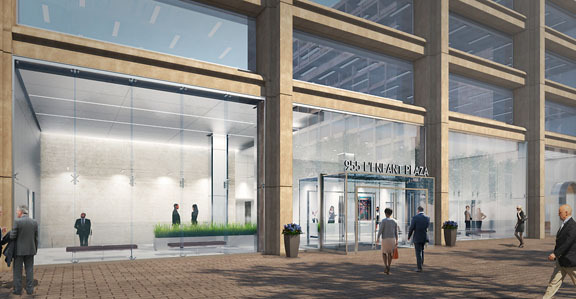 Turn left near the glass atrium and enter the 955 building through the glass lobby doors. When you exit the hotel, turn left and walk 2 blocks to the corner of 7th and E Streets SW. At the corner, turn right. Walk one block north to D Street. At D Street, turn left. Once you reach the building, go inside and proceed up the stairs. Take the elevators on the left or the stairs on the right to the 1st floor. Note: The D Street entrance isn't handicap accessible. If you cannot take stairs, please take a taxi and ask the driver to take you to the L’Enfant Promenade plaza entrance (955 L’Enfant Plaza SW), which is on the opposite side of the building from the D Street entrance. Enter the lobby through the glass doors. Instruct the driver to the following address: 955 L’Enfant Plaza SW, Washington, D.C. 20024. Request to be dropped off at the L’Enfant Plaza 1st floor level outside of the 955 building. Enter the main lobby at 955 through the glass doors.